Citation Information: J Clin Invest. 2012;122(8):2847-2856. https://doi.org/10.1172/JCI63689. Memory CD4+ T cells combat viral infection and contribute to protective immune responses through multiple mechanisms, but how these pathways interact is unclear. 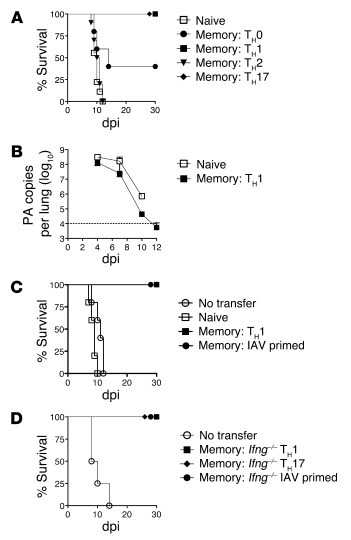 We found that several pathways involving memory CD4+ T cells act together to effectively clear influenza A virus (IAV) in otherwise unprimed mice. Memory CD4+ T cell protection was enhanced through synergy with naive B cells or CD8+ T cells and maximized when both were present. However, memory CD4+ T cells protected against lower viral doses independently of other lymphocytes through production of IFN-γ. Moreover, memory CD4+ T cells selected for epitope-specific viral escape mutants via a perforin-dependent pathway. By deconstructing protective immunity mediated by memory CD4+ T cells, we demonstrated that this population simultaneously acts through multiple pathways to provide a high level of protection that ensures eradication of rapidly mutating pathogens such as IAV. This redundancy indicates the need for reductionist approaches for delineating the individual mechanisms of protection mediated by memory CD4+ T cells responding to pathogens. Memory CD4+ T cell protection against lethal IAV infection. 5 × 106 naive or in vitro–generated memory HNT cells, polarized as stated, were transferred to unprimed WT hosts that were then infected with 10,000 EID50 PR8. (A) Survival for n = 10/group and (B) viral titers for n = 4/group (representative of 3 similar experiments). (C) 5 × 106 in vivo, IAV-primed memory HNT cells were transferred to WT host mice, then infected as in A (representative of 2 independent experiments with n = 5/group). (D) 5 × 106Ifng–/– TH1 or TH17-polarized or in vivo–primed memory HNT cells were transferred to unprimed WT hosts, then infected with 10,000 EID50 PR8. Survival for n = 10/group (representative of 3 separate experiments).